With all the traveling I do, I am constantly in the sun, on airplanes and pretty much have 24/7 jetlag-it’s not the most ideal for my skin, and it definitely takes a wear and tear. Fortunately up until this point, I have been extremely lucky to have had great skin- I’ve never had pimples or break outs in my life, and barely any sunspots, lines or wrinkles (thank you mom & dad), but I realized it’s time now to start taking it seriously and take care of my skin before it’s too late. Aging is a b*tch! When I got invited to an event recently held by SkinCeuticals, I was excited to attend and learn about their skin care products. People have always asked me my skin routine and what products I use, and I never had the answers because I honestly never did anything but soap and water. Attending this brunch was life changing for my skin- it was the first step in inspiring my new skin routine and now I can proudly say I use SkinCeuticals daily, and am really happy with the product. The SkinCeuticals event was a cute and intimate brunch held poolside at the Avalon Hotel with a few other bloggers. We learned about Atmospheric Skin Aging and how pollution and other environmental factors effects the skin and causes problems- with a lot bigger of an impact than we are aware of. 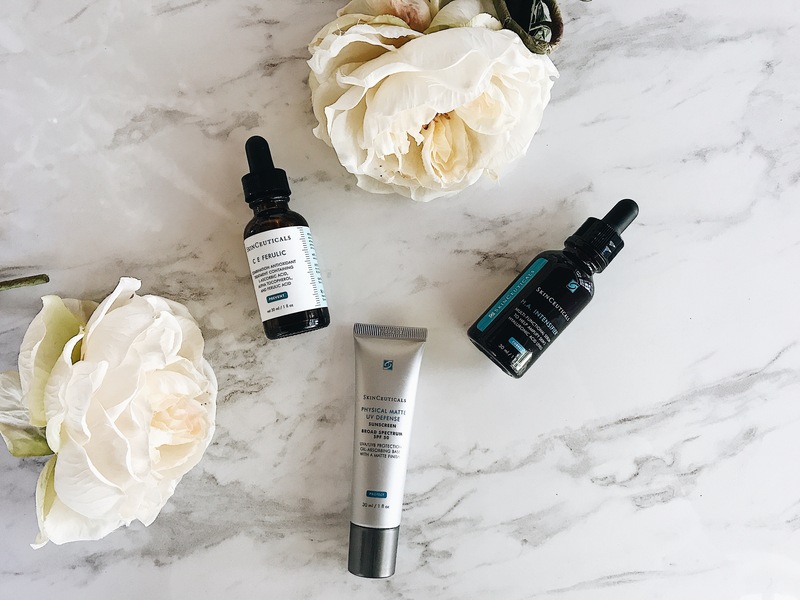 SkinCeuticals is known for working with actual doctors and dermatologists to create their products, which are scientifically tested and proven to have working results. They use natural ingredients like antioxidants and Vitamin C which is crucial in maintaining skin health. The one thing that was stressed repeatedly during the brunch was the importance of using SPF to protect your skin from the sun and ozone. SkinCeuticals has for the first time demonstrated in live skin that exposure to ozone pollution causes visible skin aging by reducing collagen. The products have been shown to improve skin health by protecting the skin from environmental damage and improving skin clarity and texture to minimize lines and wrinkles. I’ve actually come to find out that most skin care doctors and dermatologists actually recommend using SkinCeutical products for anti-aging and skin protection and a study by Skin Ceuticals is published in the Journal of Investigative Dermatology- they are the real deal! Morning: Rinse my face with water. Pat dry with clean towel, or let air dry. Apply 4-5 drops of Skin Ceuticals C E Ferulic serum on clean face, neck and chest. Then apply 4-6 drops of H.A. Intensifier on face. Let air dry. I either apply the Physical Matte UV Defense SPF 50 and a daily SkinCeutical Moisturizer before applying my makeup. Night: I always take off my makeup no matter what. I can ever go to bed with makeup on. On a clean face, I apply 4-6 drops of SkinCeuticals H.A. Intensifer and apply with a thicker night cream to really moisturize my skin when I sleep. One of their best sellers! Full of antioxidants and vitamins, this morning serum is hydrating and has anti-aging benefits, reducing fine lines and wrinkles. I love this because it’s a light serum that soaks right into your skin, it doesn’t feel thick or sticky. Application: Apply once in the morning on the face, neck and chest with the H.A Intensifier and a SkinCeuticals broad-spectrum sunscreen to revitalize the skin and provide the ultimate protection from UV light. Multi beneficial formula to help amplify the skin’s hyaluronic acid levels and renew plumpness, elasticity and firmness of the skin. Application: Twice daily, apply 4-6 drops to face. Use after SkinCeuticals antioxidant and follow with a moisturizer and sunscreen. Provides UV skin protecting with an oil absorbing base and a matte finish- minimizing the appearance of surface oil and sweat on the face. Application: Apply to face, neck and chest 15 min before sun exposure, and before applying makeup. For a brand that has proven results and is trusted by skin care professionals, I highly recommend SkinCeuticals. I chose them to start my skin care journey and am excited to see the process. This post is in collaboration with SkinCeuticals. All opinions are my own.